e professional looking HDR photographs, it's essential that you minimize (if not eliminate) the movement between frames. Unless you have a very steady hand (and let's face it, you don't) the only way to minimize these movements is to invest in a high quality camera stabilizer or tripod. Below we will touch on a few of these tripods for both beginners and experts and make a few recommendations that will allow you to use a tripod to get the most out of your equipment. Sunpak 620-757TM Tripod ($80) – The Sunpak tripod is a great starter tripod and very reasonably priced starting around $80 on Amazon. The Sunpak isn't the lightest tripod on the block at 6lbs, but it can support cameras up to 15lbs and extends to 73” making it an ideal first pick. Chances are if you're getting started with HDR you've got a Canon Rebel or entry level Nikon, this tripod will work great. If you're getting into some stuff with heavier lenses then you may run into trouble as the head isn't necessarily the best, but this is an excellent choice if you have any of the starter lenses, or my personally favorite for Nikon, the 35mm f/1.8. SLIK PRO 700DX Professional Tripod with Panhead ($135) – If you have a little bit more in your budget, then this offering from Slik is definitely not a bad option. It's height difference over the Sunpak is negligible at less than 2 inches, but it is slightly heavier at about 7 pounds. I'm based out of Bali, and most of my travel is minimalist backpacker style. So I'm very sensitive to weight when I'm going on shooting excursions. That said, I've used this one in the field twice and it held up well with all of the lenses I used. It could handle my 70-300mm much better than the Sunpak, so for that reason I think it's worth the extra money (and weight) if you're still in the start tripod range. The closest you're going to get to a pro-level tripod at an entry level price from my experience. So what what if you've been shooting for awhile? You're no stranger to high quality equipment or HDR and you want something that's going to help you take your skills and photos to the next level. Well, then it's time to get serious with your tripod. As you get into the higher end of things, you'll probably start piecing your tripod together based on your needs. This means purchasing your legs and heads separately, and potentially going for high end carbon fiber materials rather than plastic or titanium. 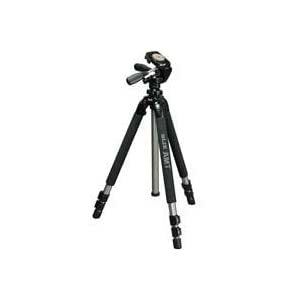 Gitzo GT3541XLS Series Carbon Fiber Systematic Tripod ($750)– So you're ready to play with the big boys now? Well this will definitely make you king of the “photographer's block” as this is one of the best sets of legs on the market. Are you shooting full frame or with giant heavy lenses? This tripod will be your best friend. I've been shooting with this for the last 3 months after making a (very big) upgrade from the Sunpak model, and it's been incredible. As I mentioned weight is very important to me, and these sticks weigh next to nothing. What's better is the stability in it's range. It doesn't matter how low or high I set these up, my camera remains still and secure. Manfrotto 190CX3 3-Section Carbon Fiber Tripod Kit ($439, $250 without head) – So not in the mood to shell out $750 bucks for the Gitzo model? Can't say we completely blame you. You're in luck however, as the Manfrotto 190 is a fraction of the price at around $250, and while not quite as light, and not quite as stable, for the money it's still an excellent tripod. It's most often paired as a kit with the 501 HDV head, and after using it for one full day session, we'd have to agree that for full tripods at less than $500, this one is a force to be reckoned with. When you're picking up your legs separately, that means you need to buy your head on it's own as well. Most of my experience has been with Ball-Heads as they tend to be more compact, and I rarely find myself using too many over-sized lenses, so it's a good way to go. Make sure you keep the weight-rating in mind for your needs, but here are a few of the heads I've had the best luck with. Arca-Swiss Monoball Z1 sp with Quick Release ($389) – the Arca- Swiss is one of the most popular ball-heads on the market. Light-weight, simple, and easy to use the Arca is definitely our top pick for ball-heads (but I may be biased, considering this is what I put on my Gitzo legs). As mentioned I'm not usually shooting with super-huge 500mm lenses or anything like that as I shoot primarily HDR landscapes (making this setup a bit overkill for me), but if you do, this is what you want. Kirk BH-3 Ball head – the BH-3 ball-head is a light-wight quick release head around $275. The two small knobs control panning and friction while the large one is for aiming and framing. Personally, I haven't used this one much, but it comes very highly recommended by many of my friends who are professional photographers. Manfrotto 498RC2 Ball Head with Quick Release – the Manfrotto 498RC2 ball-head is another great quick release model. The bottom lever adjust your pan, while the top controls the ball-head. The Manfrotto also has a dcent range of motion and locks the plate down solid. You will get smoother motion if you pay more, but at around 100 bucks, this is a MUCH less expensive option, and will work great for 90% of you. Remember with tripods, as with most camera products and accessories, you get what you pay for. If you've never purchased a tripod before you can’t go wrong with one of the cheap ones listed above. They are great introductory models and will help you understand how you can use a tripod to generate cleaner shots. Once you see the potential you can also upgrade to a more professional model that will serve you unique shooting style and purpose. For more experienced photographers, upgrading your tripod can be one of the smartest decisions you make especially if you shoot HDR or shoot in night/low light. +Sean Ogle is an entrepreneur who spends a lot of his time traveling. He took up HDR photography while living in Asia in early 2010 and has been enamored with the medium ever since. He writes about business and travel at Location 180 and helps others build their own lifestyle business at Location Rebel. Great article and roundup. I appreciate that you included some budget options. I think another factor is ease of adjustment. I’m using the Manfrotto 055XPROB Pro Tripod with the 322RC2 head and readily admit it’s not the lightest combination, but it serves me well for now and is fairly easy to change adjustment on. I think I’d go easier on the “for beginners” stuff. This can sound condescending toward somebody who is new to photography, but who may be a past-expert at something else. Best to assume intelligence until we know otherwise! I’d just show the wide range of options, features, and prices, noting that you most often get what you pay for!